Ofcom has revealed how broadband and phone companies are serving their customers, in our biggest survey into customer service in the telecoms sector. We looked at how each of the major providers performed in 2017 when it came to measures such as customer satisfaction, dealing with complaints and how long it took to answer customers’ calls. The findings give consumers an idea of what level of customer service they can expect to receive, helping them to shop around for a provider that’s right for them. Eight in ten broadband customers told us they were satisfied with the service they received from their broadband provider. 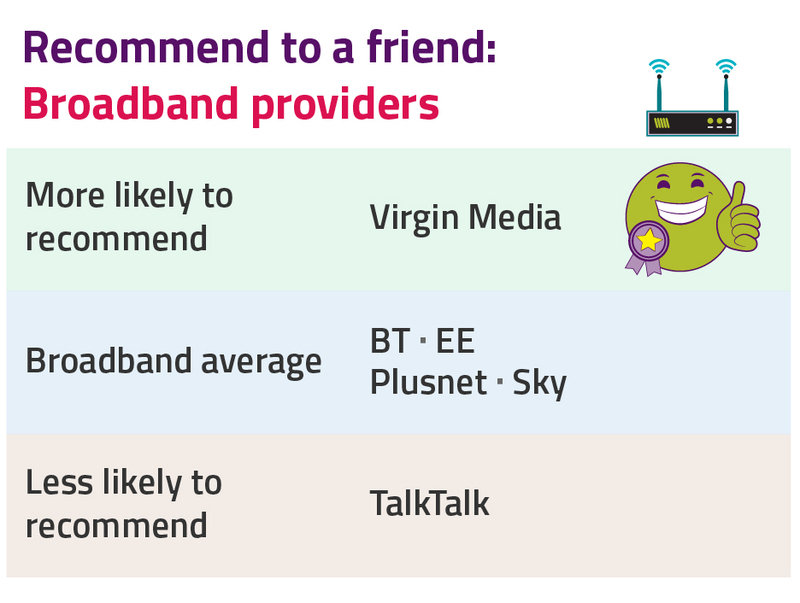 Virgin Media broadband customers were more likely to recommend it to a friend, while Virgin Media was the only provider with above-average customer satisfaction for broadband speeds. Meanwhile, TalkTalk customers were less likely to recommend it to a friend, and their satisfaction was below average. TalkTalk customers were also more likely to have a reason to complain and less likely to have their complaint completely resolved. Sky and EE scored well on general customer service, including how they handled complaints. More than nine in ten mobile customers were satisfied with their service. 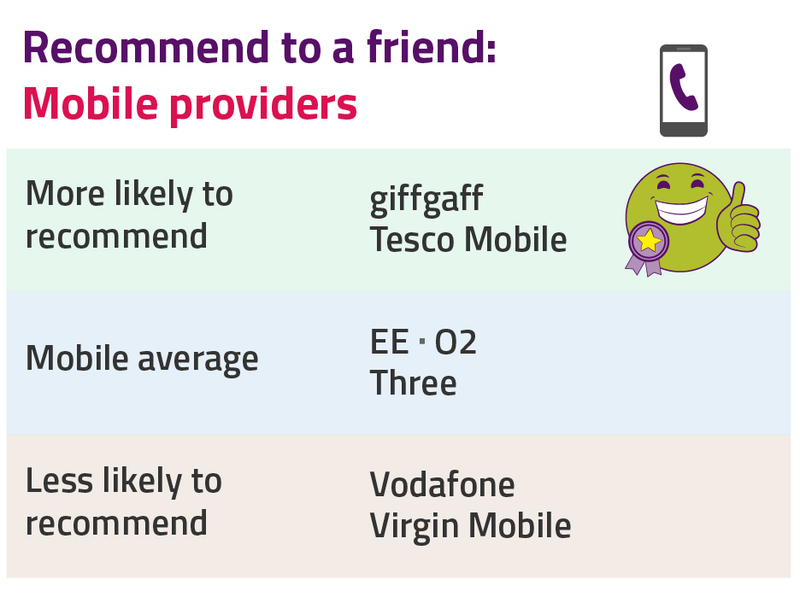 Tesco Mobile and giffgaff were the mobile companies that customers were more likely to recommend to a friend. Vodafone and Virgin Mobile were less likely to be recommended. These two companies also score below average in a number of satisfaction rankings, particularly when it comes to handling complaints. 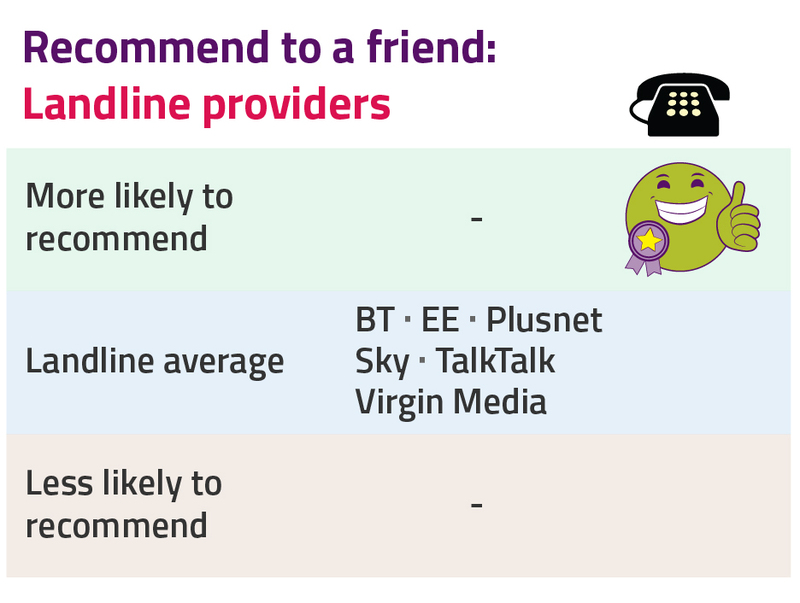 Landline providers all received average recommend to a friend scores - there was not much difference in the likelihood of customers recommending each of the providers. This survey is just one of the ways we’re aiming to improve the service you receive from broadband and phone providers. We recently updated on our work to make it easier for people to shop around, including work to let customers know when their contract expires. We are also ensuring that people receive automatic compensation when things go wrong; get better information on broadband speeds before entering a contract; and benefit from tough targets for repairs and installations. We’ve also put together some simple tips on improving your broadband or mobile service.